GALCO AG800B ankle glove ankle holster Glock 43 steerhide black. Crafted from the highest quality material to ensure quality and durability. 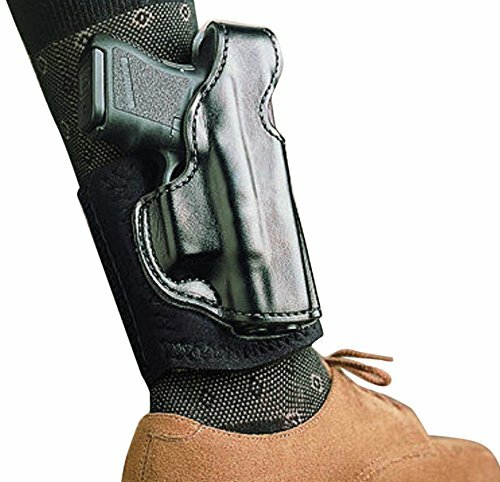 DeSantis announces its latest improvement in concealment leather, the #014 Die Hard Ankle Rig. It's built from top grain saddle leather and finished on the outside with a super tough PU coating. This combination of materials was originally designed for Federal Law Enforcement with longevity and performance as primary concerns. 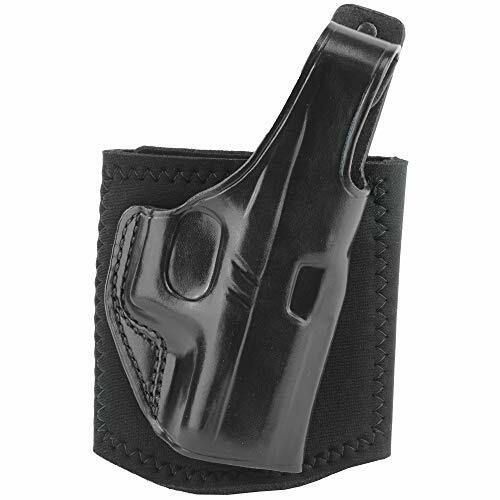 The smooth leather lining protects the gun's finish and offers a quick, silky draw. The Die Hard Ankle Rig features a tough top grain leather lined holster with a conventional thumb break that has been attached to a neoprene leg band. The leg band is both padded with foam and lined with sheepskin. A calf strap (C14) and boot extender (C15) are optional. This meticulously molded holster is both handsome and very comfortable. Available in Black. Serious gun Carriers who need deep concealment and prefer an ankle holster rave about galco's ankle glove. 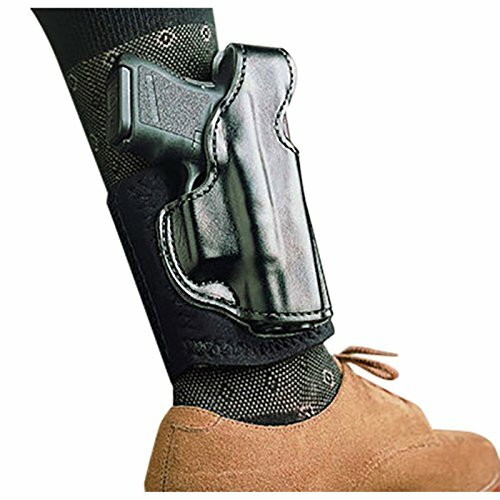 those who need concealment 80 hours a week, year in and year out, find the ankle glove so comfortable to wear that they forget it's there - until they need it. The ankle Glove's wide neoprene ankle band and Velcro closure offer extended wearing comfort and unmatched security. 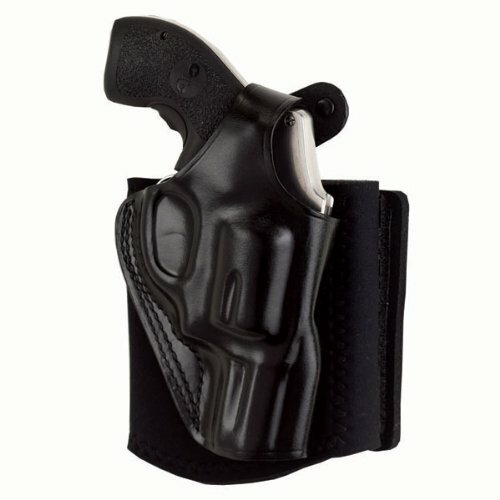 Additional comfort is provided by sheepskin padding between the holster and ankle. It also features a reinforced thumb break for speed of draw and detailed molding for firearm retention. 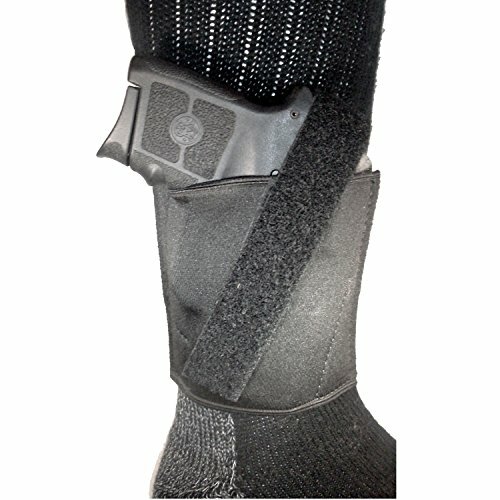 Desantis top grain saddle leather thumb break ankle holster with neoprene band and sheepskin lining is Desantis latest improvement in concealment leather. The #014 die hard ankle rig is built from top grain saddle leather and finished on the outside with a super tough PU coating. This combination of materials was originally designed for Federal law enforcement with longevity and performance as primary concerns. The smooth leather lining protects the gun's finish and offers a quick, silky draw. The die hard ankle rig features a tough top grain leather lined holster with a conventional thumb break that has been attached to a neoprene leg band. The leg band is both padded with foam and lined with sheepskin. A calf strap (C14) and boot extender (C15) are optional. This meticulously molded holster is both handsome and very comfortable. Available in black. 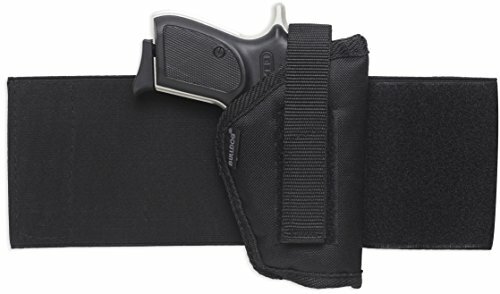 This Gould & Goodrich holster has an adjustable elastic band helps keep gun secure. Sheepskin lined for comfort. Optional leg garter model B865 available. Fits most medium auto pistols and small revolvers including Beretta Cougar; Glock 26 and 27; Kahr 9, 40, P380 with Crimson Trace; Ruger LC9, LCR and LCP with Crimson Trace; Sig 239, P938, 290; S&W small J-Frame revolvers; S&W BG38; Taurus PT111, PT140, small J-Frame revolvers; SCCY CPX1, CPX2; BERETTA NANO. 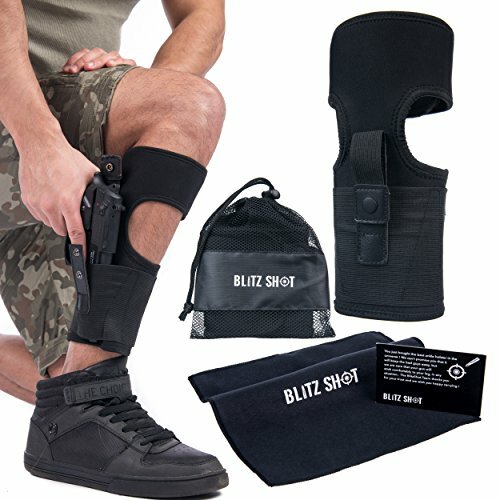 Want more Right Hand Black Ankle Holster similar ideas? Try to explore these searches: Shower Caddy Brass, Printed Silk Top, and Faux Leather Buckle Accents.